Cleaning, organizing, saving, and all things domestic! One day, while searching for a cleaning hack for my stained shower, I stumbled across the term “speed cleaning”. Ever heard of it? I hadn’t, but having done cleaning as a profession for years, I was intrigued. This new found term could not have come into my brain at a better time. Yes, you read that right, I have done professional cleaning for years, but when it came to my own home I found it close to impossible (especially at times of transition) to clean my own home to the same level that was commonly expected of me in the professional environment. I have been looking around for the one article that really helped me to be able to tackle this idea in a productive way. Upon reading it, I was skeptical. She claimed that she was able to clean her four bedroom, two bath (or so) home in under an hour every day. I decided to give it a try for one week, but was not holding my breath. So far, I’ve been unable to find that particular article that helped me out so much. If I do, I will definitely share it with you. However, this is what we’ve adapted for our own home. My hope is that you can take some of these tricks and ideas and adapt them to your individual needs and skills. I will cover different techniques and ideas to get you started, then I will share what exactly we do in our speed cleaning routine as an example. I’ve found that I eventually get things routinely clean and organized to my liking once things settle down in our day-to-day. The problem for me most often comes when we move, reset our school stations, or need to set up new spaces. In other words: the clutter. It begins to take a priority because I can’t even see or get to the dirt and grime until things are in their proper place. I do one room at a time, always starting with the “clutter bucket”. You can use any handy container for this, but we usually use our large rectangular laundry basket. The concept is simple. I go through the room counter-clockwise, and top to bottom with one goal in mind: to remove everything that does not belong IN THAT ROOM. For instance, if I am trying to remove clutter from the kitchen, I place any paperwork, mail, keys, loose change, etc. 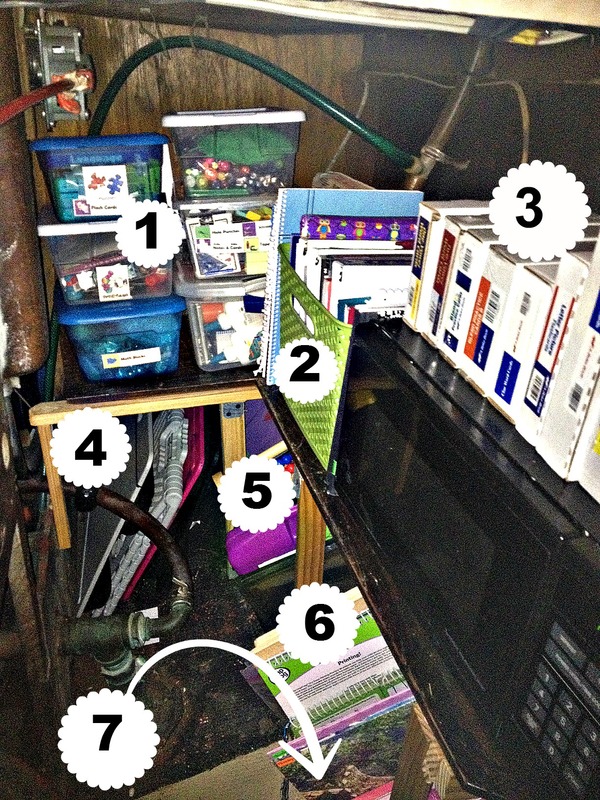 into the “clutter bucket”. Then, I ignore it until the very end. This is probably the number one time saver that I’ve found throughout years of housekeeping. This way, I’m not stuck walking back and forth, to and fro putting each tiny thing where it belongs. Instead, when the house is entirely clean and clutter-free, I make one stop to each room to put things back into their proper place. I can’t stress this one tip enough. It is such a time saver! Everyone made the mess, everyone can help clean it up. Right down to the youngest child, they can all do their part. I’ve found that for my four year old and six year old, it’s best to start them in their own space. They know where their own toys and clothes belong and are required to do that first. I break it up for them so that it isn’t too overwhelming. “First, put your toys away”. Their bins are all labeled with pictures and words so that they can easily find where their things belong and act accordingly. “Next, put your laundry away. Clean items go in your dresser/ closet, and dirty items go in your hamper”. “Finally, Refold any of your drawers that are getting out of sorts”. My youngest still has trouble with this one, so she usually just starts on their next task: emptying the clutter bucket. I’ve had times where they have everything put away as fast as I can put it in the bucket. I’ve also had times where there are still a few items remaining when we are done. Either way, its yet another time saver. It usually keeps them busy while I’m doing something like the bathrooms that they can’t help with much at all. Replace these items as needed at the end of each speed cleaning round so that you are not searching for anything as you are cleaning. This tip is not for everyone. It usually helps me to have one as a reference for each room when I’m getting into the groove of a new place, but I don’t seem to ever use them long before it ends up taking more time than it’s worth to go back and forth to check it. I will recommend you at least write out your daily plans for each room. It’s up to you on whether you feel you need it for a constant reference or not. If you are the type of person who could benefit from this, I recommend writing or printing it out on 3″x 5″ note cards. 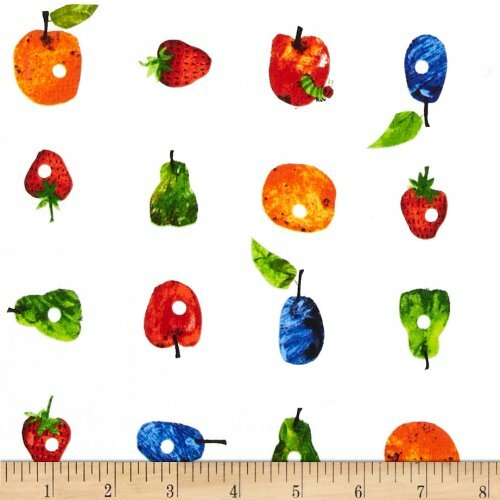 Laminate them (or place them into plastic baggies like we did for our homemade dry erase book) and put them on a ring so you can easily flip through them and place them in your caddy/ apron when not in use. You’ve probably at least heard the top-to-bottom rule. This one makes sense because you don’t want the dust from your ceiling fan landing on the floor you just vacuumed, right? Cleaning counter-clockwise (right to left) allows your brain to see what needs to be cleaned as you go. We are naturally inclined to go the opposite direction. For instance, we read from left to right. If you force yourself to do the opposite, you’ll be surprised how effective you can be. This is the only thing I typically save to do for all the rooms at the same time. It doesn’t make sense to lug the vacuum or mop and broom around with your cleaning caddy and clutter bucket. Once every room is completely clean, you can go through and knock the floors out all at once. Go top to bottom and right to left through the room and pick up anything that does not belong in the space. Put these items either where they belong in the bedroom, or into the clutter bucket. Dust. Top to bottom, and right to left, dust every horizontal surface you come across. Ceiling fans, Bookshelves, headboards, dressers, desks, window sills, baseboards, t.v.s, remotes, door frames, everything. Again, I was skeptical at first that these tips would help out so much that I could only spend an hour a day and keep the whole house clean. I dare you to try it for a week though.Play some music, have fun with it. Tell the kids they’re trying to beat the clock! We ran overtime the first three days or so, because we were doing details that were being neglected more than they should, but once we get in the groove and stay in the groove, it really takes no time at all to have a truly clean home. She immediately said: “I want a caterpillar birthday!” This is one thing I love (and sometimes not so much 😉 ) about Raspberry Bug. She never picks your average Disney princess theme. It has turned out to make some very cute, original, and memorable parties. We’ve had a Hello Kitty party, a ” Hawaii flowers” party, and now a Very Hungry Caterpillar party. Luckily, I was on Pinterest and was able to find plenty more ideas where that came from! We even created a Very Hungry Caterpillar Birthday board together and had a sweet unplanned mother-daughter time that morning <3. I didn’t do everything on the Very Hungry Caterpillar Birthday board, nor did I stick to very many specifics, but I’ve found Pinterest to be extremely helpful in creating a vision for events like this. They were a bit mangled by the end of the night when I took the pictures, but for a paper bag, they worked for exactly what we’d planned. I placed a bowl full of play foods found in The Very Hungry Caterpillar story in between the two of them and it was that simple. The younger kids kept coming back to this activity throughout the duration of the caterpillar party. I have a special thing going with my children’s birthdays. They get to pick any cake they want with any theme, and I create it . This was actually one of the easiest ones I’ve had to create. Just a circle cake and some cupcakes. Compare that to Master Yoda or to a pirate ship! She did ask me to do a cherry pie, too. It was, after all one of the hungry caterpillar’s favorite snacks. I don’t know if you can see from the picture, but the vent holes in the top were actually cut from a butterfly shaped play dough cutter! The jello jigglers were also cut in the shape of butterflies. Unfortunately, the lighting was not in our favor for photos. 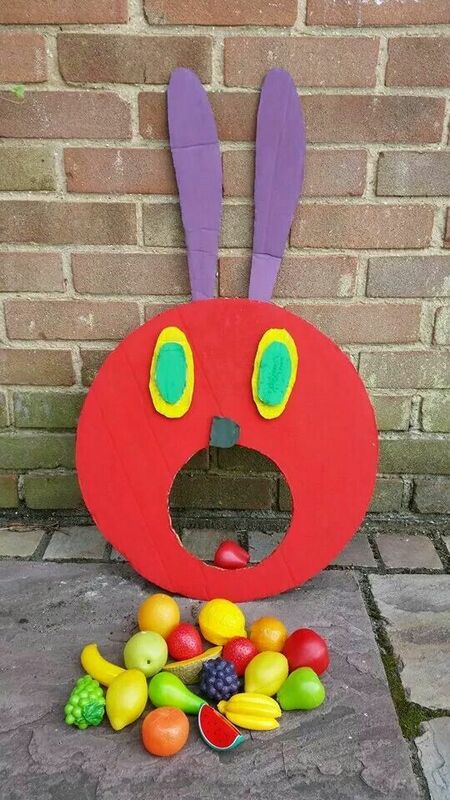 I initially wanted to hold the Very Hungry Caterpillar party outside, but it was just too hot for everyone. In case you can’t tell the caterpillars were made from construction paper circles. I put a letter on each section of the caterpillar’s body and punched a hole on opposite sides of each circle. I then strung fuzzy yarn through and tied that to the blinds to create the long, draped caterpillar effect you see here. But our caterpillar was scaled to fit the mailbox and I used large sticky foam cutouts for the letters. That one touch made it very bright and cheery. 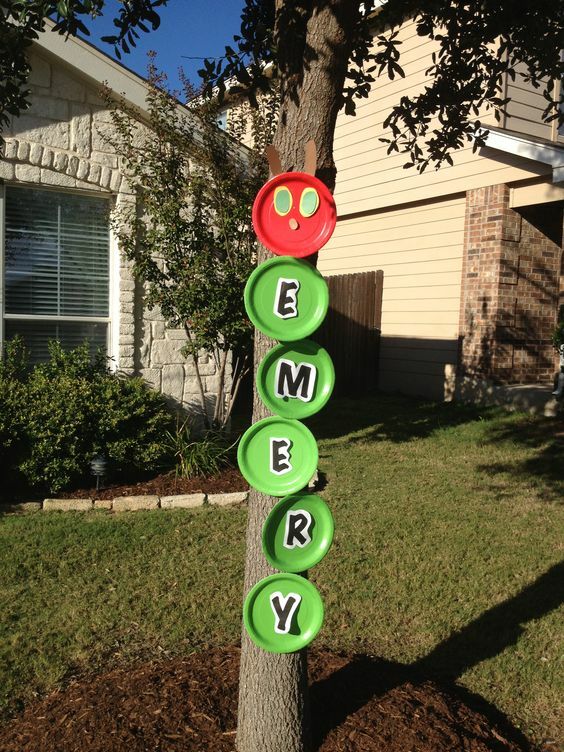 It also made the letters more visible to the passerby. I’m still kicking myself for not getting pictures. When I asked the Birthday girl what her favorite part of the day was she said without hesitation that it was pin the head on the caterpillar. I love it when they’re still young enough to view presents as a secondary bonus! This was a bit more time-consuming than some of the others (mainly because I was out of color ink and had to grab the markers instead), but this caterpillar activity was definitely worth it. 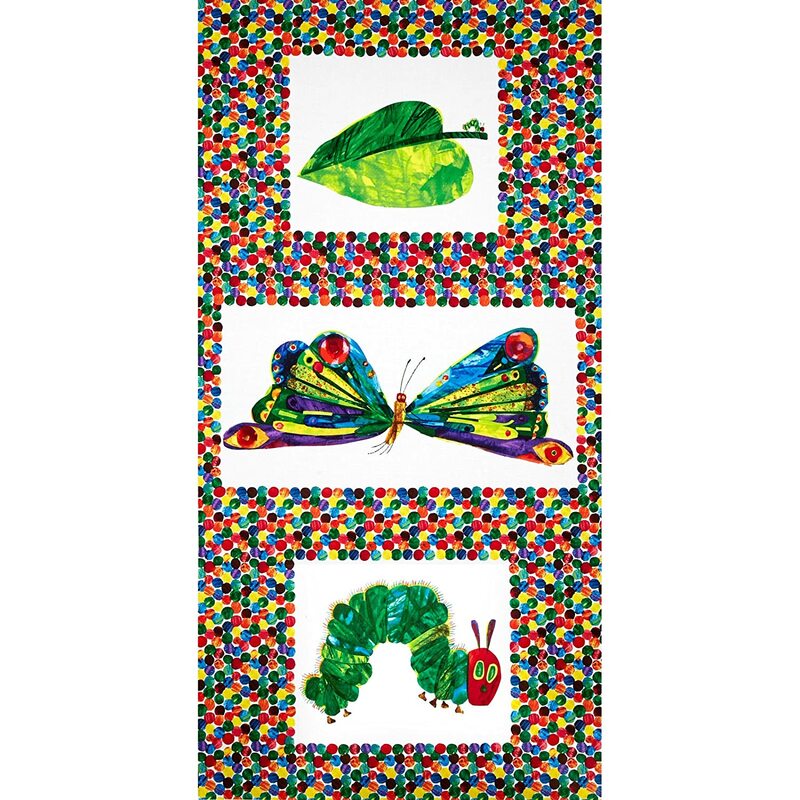 I just found a Very Hungry Caterpillar I liked from Google Images and then printed it in a 2×6 scale. Then, I pasted it into my paint program, erased the caterpillar’s body, and played with his very hungry head until it was around the same size as the whole caterpillar I made. I then proceeded to color a giant caterpillar and seven more heads… yeah. At least they were all one of a kind. On A Dime right? She loved present opening time (of course). However, I didn’t capture much of that either. Next year I will certainly pull one present down at a time for her. She ripped through them in no time! I mean, she must hold a record or something now. One of my favorite parts of The Very Hungry Caterpillar party was the dress she wore. A close family friend had one sent over here the night before the party so she could wear it and wrapped a whole other one for her to open at the party. SO PRECIOUS! And it twirls beautifully on my four year old! Another successful DIY party. Who knew The Very Hungry Caterpillar could be so fun! It’s taken me way longer than expected to get a system down that I like especially when it comes to all of our new supplies in relation to what I need to prepare each night for the following day of home school. I spent a great deal of time brainstorming for ideas. I scoured the internet searching terms like “small space home school” and “home school closet organizing”. I found little if anything to help me. When you are talking about thirty total feet of living space, I found that generally people who live in (even a small) average living space have no clue what the term “small space” really means. It got very irritating trying to imitate spaces that I liked and then attempting to fit it into our small space and lifestyle choice. Unfortunately, with our limited counter space, the microwave had to stay there by the fridge.The rest had to be used for schoolwork (despite the temptation to share it with Mommy’s craft items). Plastic shoe boxes are a lifesaver when living on The Armor Of God. We use them for anything from school supplies, to toys, to socks and underwear, to hygiene products. It is an easy way to keep things contained (when we do set sail) and it utilizes all of our vertical space by making everything stack-able. The items I changed around last night have yet to be labeled, but they will be. I (and the littles) need to be able to find everything easily. Raspberry Bug’s puzzles, flashcards, and clip cards. These started as just leftovers from Blueberry Ball’s schoolwork last year. The next shoebox (moving downward) holds their chore chart incentives. Each Friday they get a toy (chosen and displayed the previous week) if they completed enough of their tasks. Next we have the one that’s labeled “math blocks”. 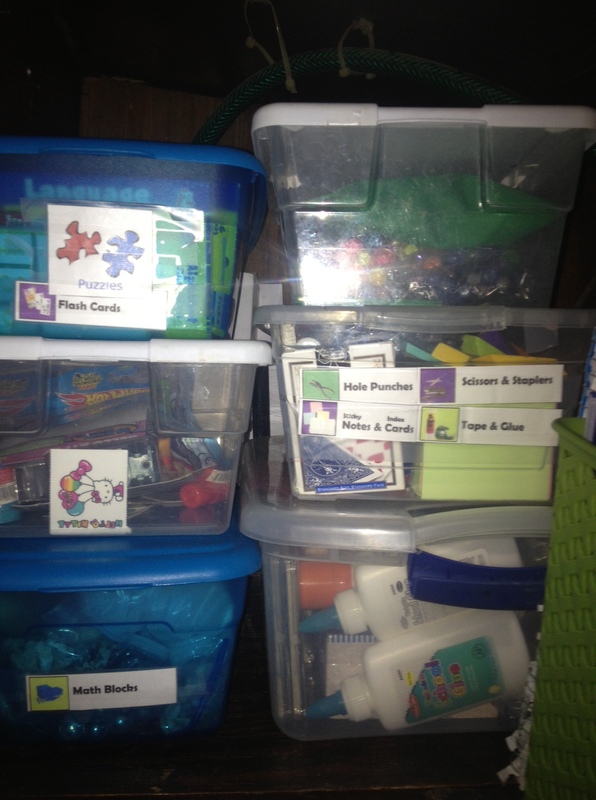 I have various counters and manipulatives stored here. Anything from seashells, to pennies, to beads and more. 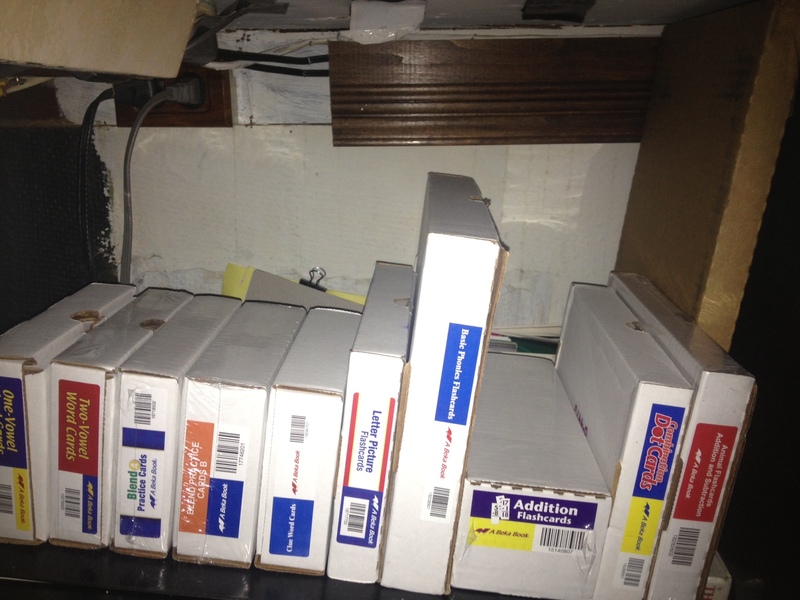 They are all organized and separated using labeled zip-top bags. The next shoebox (top left) is extra pencils along with the teacher’s grading pens, sharpies, and highlighters. These are also separated and labeled in individual zip-top bags. I’m probably going to downsize this one soon as the space is not being used to it’s full potential. Going down, we have the teacher’s box. This holds all of Mommy-teacher’s sticky notes, cue cards, hole punches, tape and glue sticks, and more. Whatever I may need for planning and preparation that I don’t exactly want the children getting into regularly. The last box is larger and not as accessible, but it doesn’t have to be either. It holds all of our craft supplies. Pipe cleaners, pom poms, cotton balls, q-tips, food coloring, homemade and store bought paints, brushes and smocks, extra glue, tissue paper, bubbles, craft sticks, and more are all kept here. Our art activities are well-planned in advance these days and I can pull it out and dig through it as the kids are sleeping, so I don’t mind it being behind some of the more important things. Our play-clay and some of the other sensory play items are kept in our dock box. Mommy can’t stand play-clay inside anyway =). The labels I used are from Heart Of Wisdom and Org Junkie. 2) Turning the corner, to the left, we have probably the most important (or at least the most used) basket. This is my “A Beka Basket” where I keep the books that Blue won’t be using in the upcoming lesson, along with visuals, charts and games, and flashcards that had no box with them (I do wish they’d all come with that convenience). 3) The boxes came pre-labeled (thank goodness!) and I separated the “Letters And Sounds” cards from the “Numbers” cards. 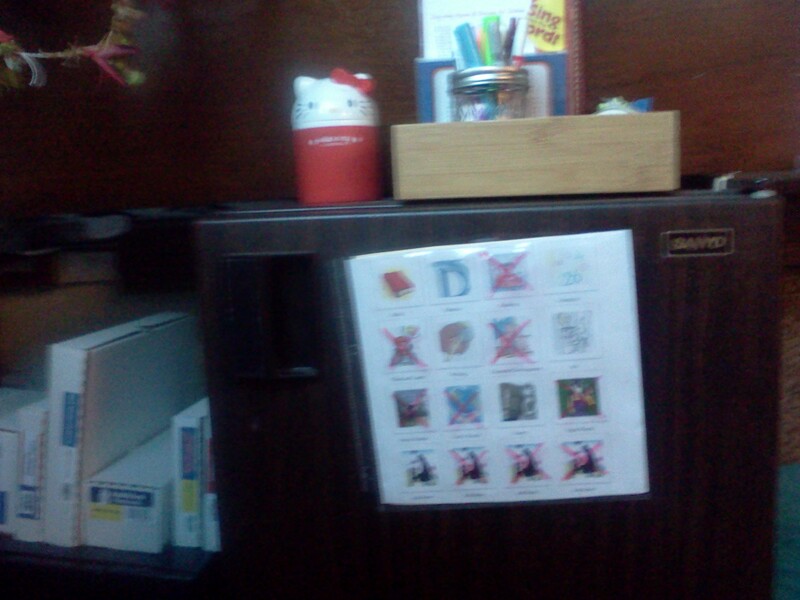 Behind the microwave, I tucked away the extra large sticker pads and coloring books along with our rolls of art paper. 4) This is a convenient place for our lap desks and for our step stools (stools come in handy when it’s time to help Mommy-Teacher in the kitchen). 5) This is where Raspberry Bug’s items start. I sort of formed a boat-friendly version of our previous Free Style Art Center. It is mainly used to keep her busy when we are, or throughout the day. She loves to “do school”. 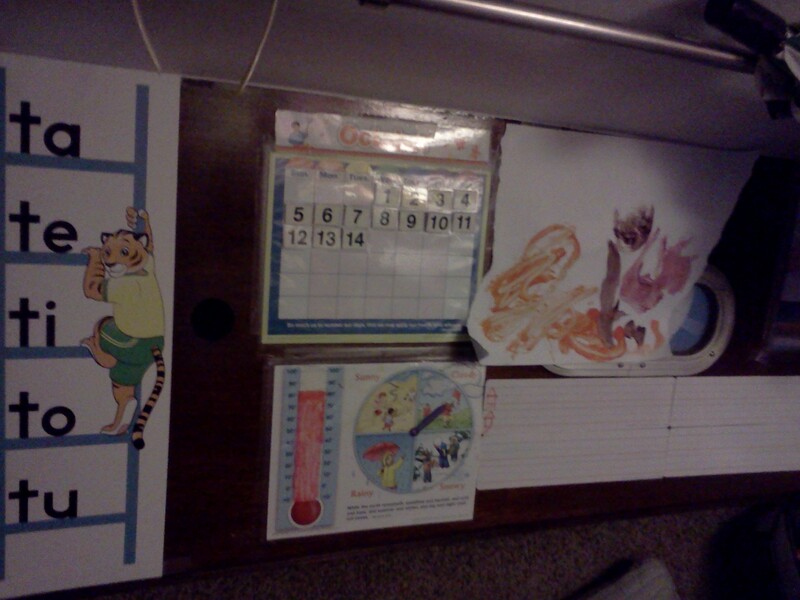 Her dry erase/ chalkboard easel goes here along with the abacus, large dominoes, Lacing Cards, and alphabet books. 6)Here is where visibility starts to diminish. Sorry; it really is a tight space.You can’t see the center very well because that’s where the items get shorter. On the left side Red has her Other dry erase boards. She has more of the primary lined ones along with the Leap Frog ones that Daddy was thoughtful enough to buy for her. (We used to diy the dry erase books, but they aren’t as durable.) On the right side, we have worksheets and coloring pages placed in a folder. I pick new ones each school- night so that she can keep busy with her own things during Blue’s lessons. In between these, I have our pencil boxes with dry erase markers placed closest to the dry erase boards and books and colored pencils, markers, and crayons closest to the worksheets and coloring pages. The cutting practice is near the back kind of tucked away. She still needs help with that, so I don’t want it to be too accessible. 7) You can’t see number seven at all . It is a narrow file folder box with a snap- top lid. This holds all of our ABC Jesus Loves Me materials, sight word worksheets, coloring pages and books, handwriting practice,copy paper, extra notebooks, construction paper, and more. 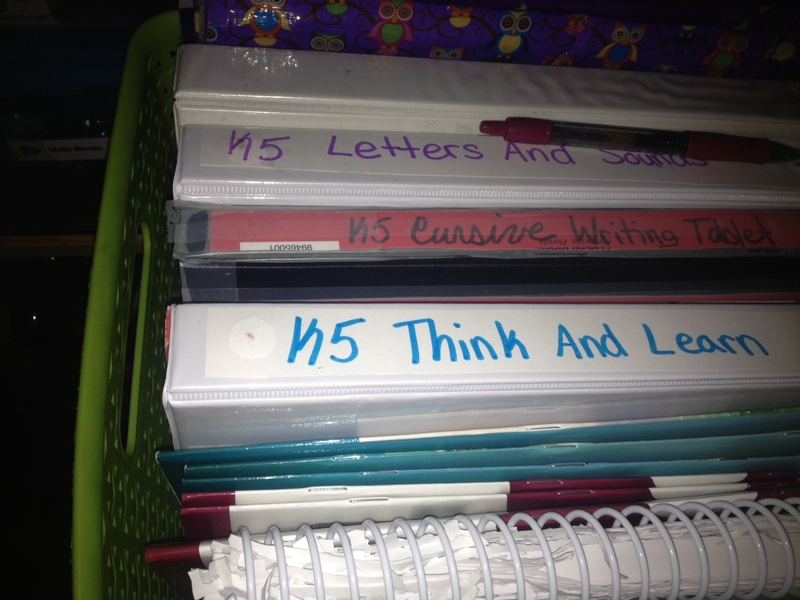 Basically Mommy-Teacher’s grab box for Red’s folders. I don’t have anything too structured for her yet (she’s only two). I pick only things that she can do all on her own to go in her “Free Style School Center” and choose at least three things a week to do with her. This way she doesn’t eat up lesson time I could be using for my K5 student, and she still feels included and accomplished. Sorry for the poor quality; these photos were taken a little later in the evening. Here we have a wooden drawer organizer. 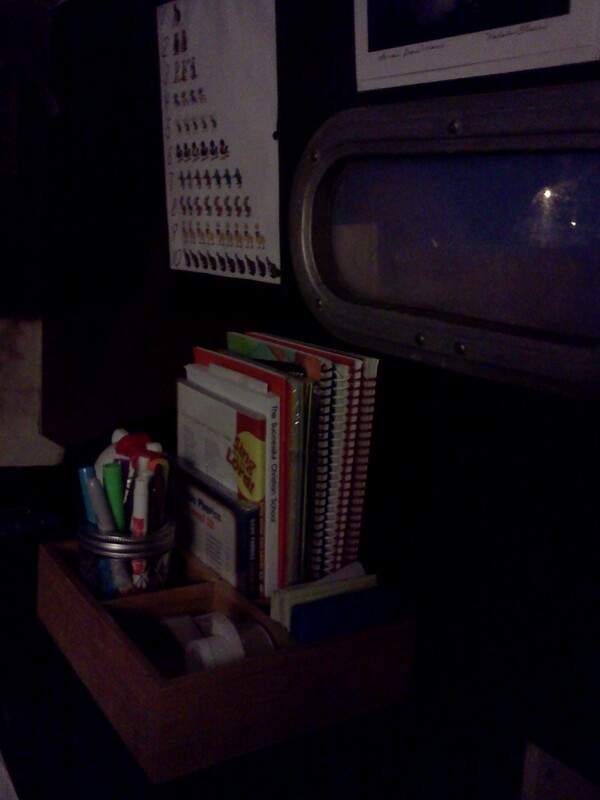 I took out one of the removable dividers and placed all of the “Readers” and CDs. Then, close to the front I placed some of our dry erase markers, Mommy Teacher’s grading pens, highlighters and a couple of sharpies into a jar (on the left) The right side holds my sticky notes and my tap dispensers. I will soon Velcro these down so that they can’t move when we are underway. I love the look and convenience of this space most of all! 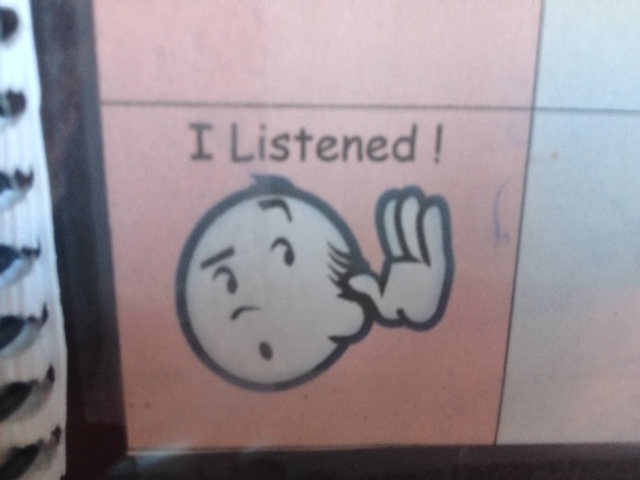 I placed a magnet on the back of our A Beka-themed task cards and placed it on the fridge. At first it was up higher with our calendar and the rest of our displays, but I found it was much more exciting to Blue when he could mark tasks off on his own. I’m not in love, but it works. I haven’t decided what will work best yet. I may end up doing a magnet board? Or a clip strip of some kind? Maybe a even a Homemade Bulletin Board? Whatever it grows into, it needs to be custom built to fit the uneven shape (It gets narrower the further back it goes.). Any ideas on this would be greatly appreciated! The blend ladders are massive compared to the size of smooth wall surfaces we have to work with. This is literally the only spot I could find that they fit. Then, we have our weather chart and our calendar. I also placed four dry erase boards up with Velcro. These are primary lined and only have two lines per board, but they are an ideal item for our small display. Artwork simply goes wherever we can cram it in right now. The pride and joy they feel in displaying it makes Mommy-teacher be able to tolerate it. Overall, I think we have a well-functioning space. And it turned out to be way better than I thought it could have been. All the stress and worry went away when I actually rolled up my sleeves and got to work. This is a recipe I adapted from The Ten Talents Cookbook (I’m not vegan or Seventh Day Adventist, but I’m in love with their cook book). I changed a few ingredients and yields to make it my own. The results were outstanding! I love the complex textures and the sweet, rich flavors. Mix the warm water and yeast together and set aside. In a separate bowl, mix honey, oil, bananas, orange zest, and vanilla. Add your yeast mixture. Fold in your oats and chia seeds. You can let them sit for ten to fifteen minutes (or five minutes for quick oats) if you want them softer, however, I liked the texture that they had without the soak. Add the flour, raisins, and salt. 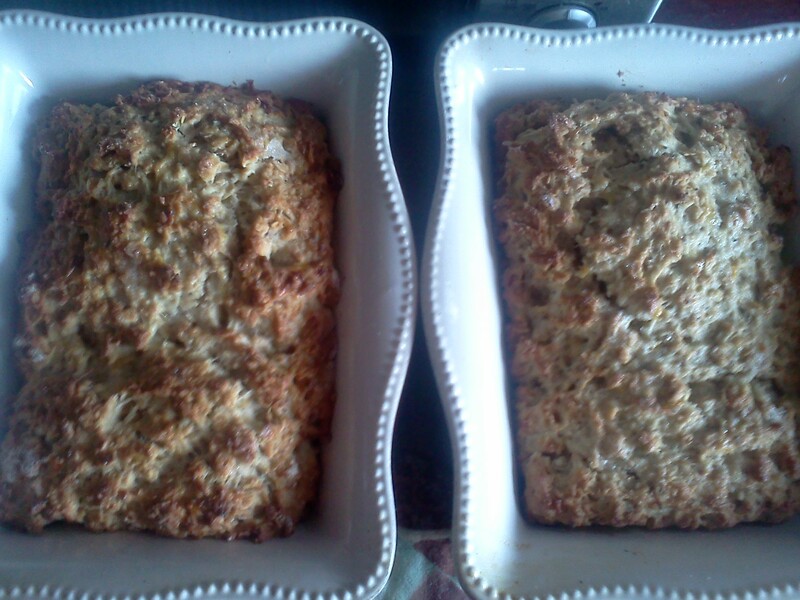 Fill two greased loaf pans or a lined muffin pan 3/4 of the way full. Let your mixture rise for ten minutes. Bake for thirty to thirty-five minutes. *Some people like to make the bananas smashed, but still chunky. I tried it this time, and was not a fan. I prefer waiting til the bananas are overripe (black and mushy), then smashing them down to almost a liquid. It seems sweeter, and makes for a smoother overall texture for your bread. The cookies turned out soft and rich. I love how the rum, vanilla, chocolate, and raspberry flavors all come together so smoothly and richly. This is a unique recipe that is a favorite at our home. I hope you enjoy it as much as we do! Mix wet ingredients together. Add flour and baking soda. Then fold in raspberry M&M’s® and oats. Spoon onto parchment lined pans to form large cookies. Bake 14-17 minutes or until the edges are a light golden brown. Rotate pans half way through the cook time. Let the cookies cool partially on baking sheet, then move them to a wire cooling rack when they are firm enough. Blue was not focusing on his school well at all yesterday. He only completed three activities. =( , so this mamma is going to do another one of her organization posts instead of the standard Monday’s Backpack post! Remember those rings that link together and to other toys? The ones you’ve probably used for attaching a favorite playmate to the stroller for walks? Well, if you still have yours, but your infant is no longer utilizing them, you can. And you can organize your closets and add more drawer space in the process. 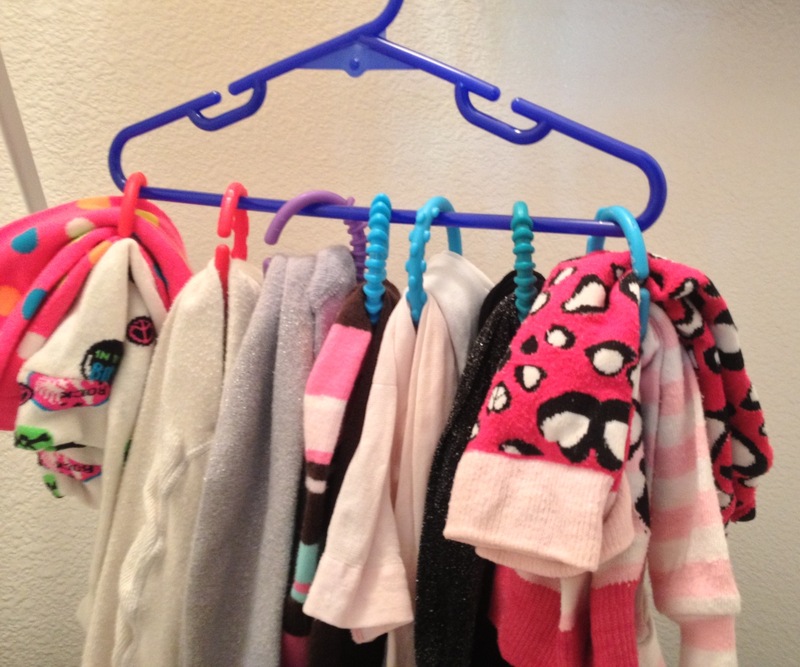 I used these handy little gadgets to organize my daughter’s many tights and legwarmers. They were almost taking charge of a whole drawer by themselves. 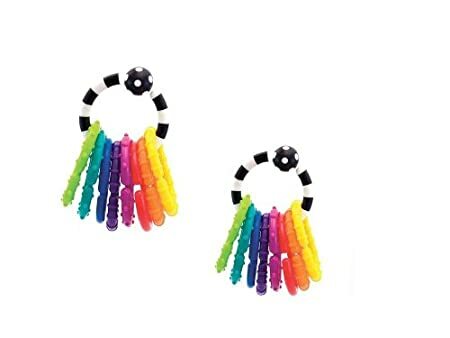 I simply placed them on the crossbar of her hanger (the part you would normally fold pants over) and looped the clothes through the rings. I was able to fit 2-3 pieces on each ring, but for the sake of convenience, you could hang one item per ring instead. It’s not just for tights and legwarmers, either. 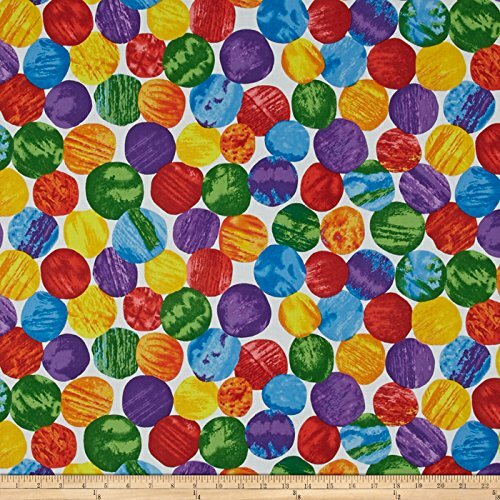 I could see using these for belts, tank tops, scarves, and neckties. I could also see using these in the laundry room for a drying rack. You could even use an extra ring in place of the hanger. Oooh… I may end up purchasing more of these! Or I may go for carabiners next. They are kind of interchangeable. The carabiners are a bit heavier, but the linky toys are less expensive. On a dime, right? Organizing Made Fun gave me 11 different ways to use carabiners. Have you been using any unconventional organization techniques in your home? Let me know and you could be featured in a post!